Information Philosophy (I-Phi) is a new philosophical method grounded in science, especially modern physics, biology, neuroscience, and the science of information. It offers novel solutions to classical problems in philosophy, notably freedom of the will, the objective foundation of values, and the problem of knowledge (epistemology). Insights into human freedom and cosmic values form the basis for a new system of belief and a guide to moral conduct. Bob Doyle is the Information Philosopher. Bob earned a Ph.D in Astrophysics from Harvard and is now an Associate in the Harvard Astronomy Department. 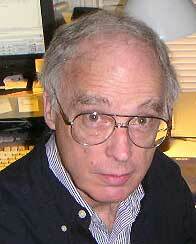 He holds several patents and is the inventor of a number of computer games, including Parker Brothers Merlin (1978). in 1984 for the then new Macintosh computer. He helped Christopher Lydon and Dave Winer create the first Podcast in 2003. He edits several websites on blog audio and video, content management, taxonomy, structured writing, the memetic web, and globalization. His goal for the I-Phi website is to provide web pages on all the major philosophers and scientists who have worked on the problems of freedom, value, and knowledge. Each page has excerpts from the thinker’s work and a critical analysis. The original three major sections of the website each have a history of the problem, the relevant physics, biology, cosmology, etc, and pages on the core concepts of the problem. In recent years, sections have been added on the mind, chance, and the quantum. Bob had the great privilege of working with some of the world’s leading philosophers of the free will problem starting in 2009, when his first published philosophy appeared in Nature. A paper in William James Studies on the two-stage free-will model of William James got Bob an invitation to the William James Symposium at Harvard in August, 2010 to present a 90-minute seminar on his ideas on free will, along with the similar ideas of a dozen scientists and philosophers since James. Since 2010, another dozen thinkers have been discovered who support the two-stage model of free will. Daniel Dennett invited Bob to take part in his graduate seminar on free will at Tufts in the Fall of 2010. He submitted many short papers to the seminar on his positions relative to Dennett’s. Bob was invited to an “Experts Meeting” on Free Will at the Social Trends Institute in Barcelona, Spain in October, 2010, along with Robert Kane, editor of the Oxford Handbook on Free Will, Alfred Mele, who directed a program at Florida State University that studied free will with a $4.4 million grant from the Templeton Foundation, and Martin Heisenberg (a son ofWerner Heisenberg), who claimed in Nature that even the lowest animals have a kind of “behavioral freedom.” They are not biological machines reacting predictably to stimuli with programmed responses. They originate actions, stochastically. In February, 2011, Bob Kane encouraged Bob to turn the Freedom section of this website into a book, which he did amazingly quickly, thanks to Adobe InDesign and a print-on-demand service at the Harvard Book Store in Harvard Square that produced 14 revisions in as many weeks. 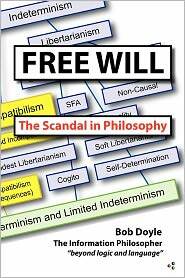 Bob’s first philosophy book – Free Will: The Scandal in Philosophy – was published on June 19, 2011, his 75th birthday. It is available on Amazon and Barnes & Noble, along with eBook versions for the Kindle and Nook. Robert O. Doyle, “Free Will: it’s a normal biological property, not a gift or a mystery,” Nature, 459, June 2009, p.1052. Powerpoint presentation at the William James Symposium, August 28, 2010. Part 2, The standard argument against free will. Part 3, Before William James. Part 4, Other Two-Stage Models. Part 5, How Behavioral Freedom in Animals Evolves to Become Free Will in Humans. Part 6, Quantum Noise in the Brain Generates Alternative Possibilities. Powerpoint presentation at the STI Experts Meeting. Free Will: The Scandal in Philosophy, I-Phi Press, June 2011. 480 pages, b&w, 40 figures, 15 sidebars, glossary, bibliography, index. Digital eBook versions for Amazon Kindle, Apple iPad, Barnes & Noble Nook, Kobo eReader, and Sony Reader, $9.95. Two Steps to Free Will, Harvard Magazine, July-August 2012. Mente e Libertà? (Mind and Freedom? ), Interview, Avvenire, June 4, 2013. So I took a course in philosophy of religion taught by Curt Ducasse, who had been a graduate student at Harvard during William James tenure. I learned that moral values are relative to different religious traditions, apart from a few axioms like “thou shalt not kill” and some form of the golden rule that seem to be universals. My third course was Existentialism, then the most exciting new philosophy, since analytical philosophy was bogged down in nit-picking arguments over the truth of linguistic statements. I read Friedrich Nietzsche, who saw values as created by human beings. They turn them into truths and moral laws to acquire power over others. They invent gods as enforcers. After the “death of God,” Jean-Paul Sartre saw us as free agents, but in the absurd situation of choosing with no moral guides. In my ethics course, I studied various attempts to get values based on reason or human nature or on feelings. The English philosophers found us to have decent value systems (e.g., utilitarianism), but no freedom of will. For them, determinism was obviously true. Causality required every action to have a cause, back to Aristotle’s first cause. As long as our own determined mind was involved as a cause of our actions and we were not coerced or constrained, this freedom of action was enough and allowed us to accept responsibility for our decisions. I was not so sure. Freedom without values is absurd. But values without freedom are useless. At Harvard to get my Ph.D. in the 1960’s, I started reading the philosophy literature on my own and building the Information Philosopher library, which is the foundation for my I-Phi website. I also learned a great deal about statistical physics (thermodynamics) and quantum mechanics. My thesis was on the quantum mechanics of the hydrogen quasi-molecule (two atoms in collision). Stanford Encyclopedia of Philosophy (SEP): The SEP is an excellent free online encyclopedia of philosophy with each entry created by experts in the field. Internet Encyclopedia of Philosophy (IEP) : The IEP is a non-profit organization that provides open access to detailed, scholarly information on key topics and philosophers in all areas of philosophy. Flickers of Freedom is an intellectual web community animated by a shared intrigue regarding the fundamental questions of action, agency, and free will. With no single ideological commitment, we are as eager to march through the various quagmires of evasion as we are to provoke panicky metaphysicians. We invite the view from the armchair, the view from the fMRI machine, and the view from nowhere. Some of us fan the flickers of freedom, others attempt to quench them, and still others insist that they are an illusion. In any case, none of us can look away. Our goal is to provide a forum that enables the vibrant, rigorous, and friendly community of scholars that already exists in this domain to be expanded and extended into the blogosphere. The principal contributors are professional scholars (philosophers and philosophically-minded practitioners in cognate disciplines) with specialized research expertise in the subject matter. Comments are open to all but will be moderated to insure the quality and civility of content. Philosophy Talk: Ken Taylor and John Perry create incredible podcasts on a wide range of philosophical questions. It’s a perfect resource for a beginner in philosophy. Philosophy Bites: A set of podcasts where hosts interview top philosophers on bite sized topics. Wi-Phi: Wi-Phi’s mission is to introduce people to the practice of philosophy by making videos that are freely available in a form that is entertaining, interesting and accessible to people with no background in the subject. Since our aim is for people to learn how to do philosophy rather than for them to simply learn what philosophers have thought, we see it as equally important to develop the critical thinking skills that are core to the methodology of philosophy. We see this as a part of a larger mission: building our collective capacity to engage in rational thought and discourse. By providing the toolkit for building better minds, we hope that Wi-Phi plays some small role in realizing that goal. History of Philosophy (without any gaps): Peter Adamson, Professor of Ancient and Medieval Philosophy at King’s College London, takes listeners through the history of Western philosophy, “without any gaps.” Beginning with the earliest ancient thinkers, the series will look at the ideas and lives of the major philosophers (eventually covering in detail such giants as Plato, Aristotle, Avicenna, Aquinas, Descartes, and Kant) as well as the lesser-known figures of the tradition. Philosopher’s Zone: A radio program that works through issues in ethics, metaphysics, and logic. PLATO (Philosophy Learning and Teaching Organization): PLATO advocates and supports introducing philosophy to K-12 students through programs, resource-sharing and the development of a national network of those working in pre-college philosophy. They have gathered an excellent set of resources on teaching philosophy at K-12 level. SAPERE (Society for the Advancement of Philosophical Enquiry and Reflection in Education): SAPERE advocates ‘the advancement of education for the public benefit, in particular amongst those young persons up to the age of 16 years, by the promotion of the development of their skills in logical thinking and other philosophical techniques so that their personal and social lives are enriched. Ask Philosopher: You ask. Philosophers answer. Teaching Children Philosophy: this organization helps adults conduct philosophical discussion with and among elementary school children. Philosophy Now: Philosophy Now is a newsstand magazine for everyone interested in ideas. It aims to corrupt innocent citizens by convincing them that philosophy can be exciting, worthwhile and comprehensible, and also to provide some light and enjoyable reading matter for those already ensnared by the muse, such as philosophy students and academics.